I was listening to a very learned man speak on how to read the Bible. He wants readers of the Bible to focus on the language of the Bible first. Identify themes, parse sentences, uncover how the writers played with their words. A perfect approach to Bible study for an English major like me. But he wasn’t lecturing to English majors. Instead, he was giving the class to seminary students. Students who may have majored in engineering in college, or political science, or women’s studies. So he had to get more detailed in showing his students how language works in certain ways. And he took quite some time on the phenomenon of comparison. A system that sometimes uses the words “like” or “as” (metaphors), and sometimes not (similes). The CEO was like an angry lion as he approached the protesters picketing outside his company’s gate. Comparison: the CEO was being compared to a lion in the above example. Are you following me, students? Well, he goes on, (after much, much more of the same) you have in the New Testament the description of the Last Supper. Jesus turns to his apostles and says, This is my body. He doesn’t say, This is like my body. But that’s what he means, isn’t it? Just because Jesus didn’t use the word like to make the comparison, it’s still a comparison, isn’t it? It wasn’t a metaphor (no use of “like” or “as). It was a simile. At this point, I stopped being an English major. It’s great to look at anything that is written (or spoken), anything that uses words and see what you see. Think what you think. React the way you feel. But it doesn’t do anyone any good to go so far as to change the nature of the text itself. A western can’t, just because you want it to, become an Edwardian romance. Or a text on ancient Chinese history cannot become a car repair manual. What’s the point of even trying? That said, there is no sense in reducing the Bible to merely a work of literature. The Bible is not like Huckleberry Finn. Or Hop On Pop. Yes, the Bible is made up of a number of books. That are written. That include stories, and histories, and lectures, and prayers, and poetry. There are various forms and expressions. But it all boils down to one thing: the Bible is a manual on the mystery of God. The book itself performs in mysterious ways. Countless people have had the experience of just opening the Bible and randomly finding a section of text that speaks to the problem on their mind. Others have turned around one minute in life and understood something that they had read in the Bible. Years before, even. And this understanding has changed the way they view life. I, personally, have spent most of my life using it as a kind of code book: when working through a vision, I listen very closely to the readings during a church service to find some words that verify the vision. I always look for verification in the Bible. But I don’t go looking for it. It has to come to me. Just like I wait until the reality of the vision comes to me. If it does come, that is. And that’s the first thing I think about the issue of transubstantiation (the belief that the bread and wine offered during the Eucharist are the actual body and blood of Jesus): if the Bible is all about the mysterious workings of God, et al., then surely communion is the place where his majesty will be made most apparent. If Jesus went through all the trouble he went through to show the people around him what works God can do, things we call, miracles, then surely Jesus would not stop at the presentation of his own upcoming miraculous feat and reduce his teaching about it to similes. I’m going to die. Then I’m going to resurrect myself. But after that, it’s all just going to be words. If it’s only words AFTER the resurrection, then, surely, doesn’t that just reduce all the rest of the Bible to mere words? And if the Bible is just words being played with in different ways, then we really are teaching the world that humans are charge of just everything. I’ve seen too much, experienced too much, to accept that as even a small possibility. 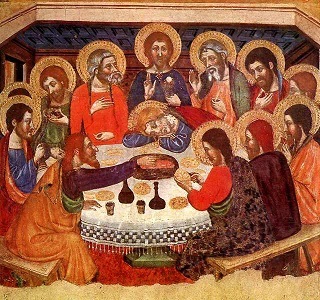 But there’s more to the Last Supper, that eventually becomes the Eucharist, than just the possibility of storytelling with the use of similes. Jesus was a Jew. He came from a culture whose priests made sacrifices at the altar. In honor of God. And during those services, the priests actually did eat the flesh of the sacrificed animal and actually did drink its blood. The eating of the flesh and the drinking of the blood occurred in reality. So why would Jesus make his own transformation of the holy sacrifice a play on words and not something that happens in reality? And, finally, the sacrifice of Jesus, himself, was real. It happened in reality. It happened in time. It happened. There were no comparisons made. No anthropomorphizing. No alliteration. He said, I am going to be the body and the blood of the sacrifice. And he went out and and gave his us his body and blood to be sacrificed. If that was real, how then is his gift to us only a matter of words, and not a reality? How do we take the reality of his world and his actions, the reality of God, the Father, working through him and reduce it to something that could be painted on a bathroom wall or read to a child before bedtime? It just doesn’t make any sense whatsoever. If we look to the Bible as a means of understanding our reality on Earth, then we need to step off the edge of the cliff and let that understanding happen.